Armor Express Traverse MOLLE Patrol Carrier FREE SHIPPING! 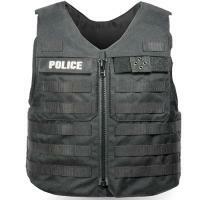 The Armour Express Traverse is designed to convert legacy concealable soft armor into an overt patrol vest. The front zip, side opening design contains internal plate pockets that can also fit UpArmor packs as well as front and rear hard armor pockets. Its heavy-duty nylon shell is extremely durable and features mesh at high friction areas to increase comfort. It contains two hidden chest pockets, a hidden lumbar map pocket and ambidextrous vertical knife/pen slots for equipment carry. It also features extensive MOLLE webbing across the front and sides for attaching accessories. Its shoulders adjust to provide a secure custom fit. ©2002-2019 CopsPlus.com: Armor Express Traverse MOLLE Patrol Carrier FREE SHIPPING!